The last bits of Atlantikwall on the western coast can be found from Bayonne (the Adour estuary) to the French-Spanish border at St Jean de Luz. Compared to the Arcachon area there's quite a density of batteries and bunkers to be found. Unfortunately due to industrialisation, housing and tourism much has disappeared too. 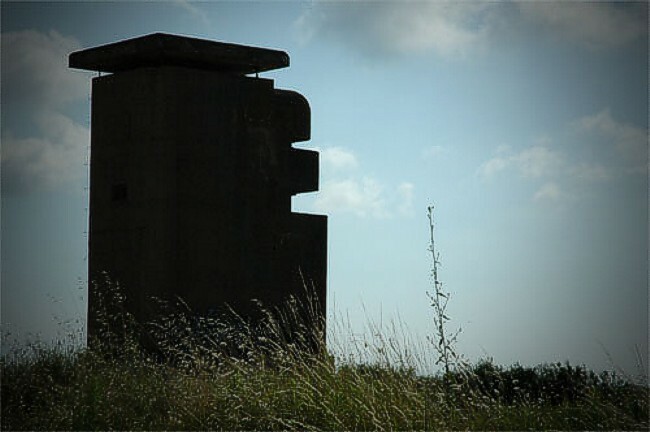 The main sites in this area are the battery Adour-Nord with the famous 'Hochleitstand' "Barbara", the coastal battery Adour-Süd (totally reshaped in 2008), the defences in and around Biarritz and the batteries of Socoa. This part of the AOK 1 was Küstenverteidigungsabschnitt F and was manned by Abteilungen of the M.A.A. 286, H.K.A.R. 1182 and 1287, E-batterie 664 and 674 and the I.R. 36, 57 and 355. The many coastal batteries provide pictures of beaches and excellent views. Additional pictures Henk Adriaanse, 2008. Fire control tower of Batterie Adour-Nord, Bayonne.